©Neil Turner/TSL. April 2005. Kabalega, Uganda. The funny thing about updating the features section on my portfolio website is that I have a section called “portraits” and another section that should be called “not portraits”. That isn’t a particularly elegant way to categorise the thirty plus images featured in that particular gallery but I have yet to find a work that sums it up. Features is as close as I seem to be able to get. Anyway, it’s a big relief to have finished the refresh and the last of the design updates for now. 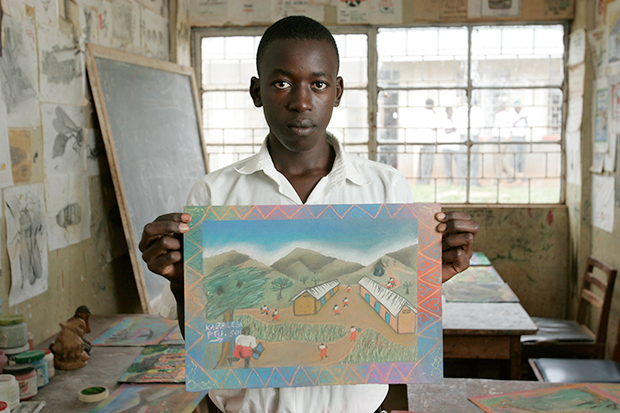 When I was looking through the huge folder of images that were under consideration I was struck by the picture above of a teenaged Ugandan boy who was part of a group helped to think about issues that were affecting their lives by an art teacher who had visited the United Kingdom where he had picked up this technique. They were an interesting set of images of a fascinating project and I’m really glad to have been able to include this picture in the new folio – even if the picture was shot nearly nine years ago. The new “features gallery” is now on show at www.dg28.com/folio/features/ and I hope that you have some time to have a look. ← Portfolio updates – finally! How do you get such even lighting like in the ‘Physiotherapist Regitse Lewis in a consultation with a patient’ and ‘Choristers from Kings School Ely on their way to sing in the Cathedral’ ? Thank you. I didn’t light either picture so I guess that I just see what’s there and work with it.